At the end of January 2006, the Washington Nationals offered Sosa two different minor-league offers, both of which he turned down, seeming to settle into retirement. On February 15, 2006, Sosa's agent Adam Katz stated: "We're not going to put him on the retirement list. We decided that [not putting him on that list] was the best thing to do. But I can say, with reasonable certainty, that we've seen Sammy in a baseball uniform for the last time." Throughout the 2006 MLB season, Sosa kept himself busy by accompanying Dominican Republic President Fernandez on several diplomatic trips including U.S., Japan and Taiwan. Then, on January 30, 2007, Sosa shocked the baseball world (but not his close friends and colleagues) by announcing that he would make an attempt to return to Major League Baseball. 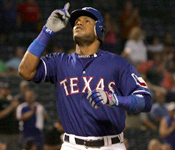 Sosa’s original team, the Texas Rangers, signed him to a minor league deal worth $500,000, the same contract that Sosa turned down the previous year from the Nationals. The contract included an invitation to Spring Training, where Sosa competed for a spot in the lineup and, after a great spring training, was added to the team's 25-man roster. 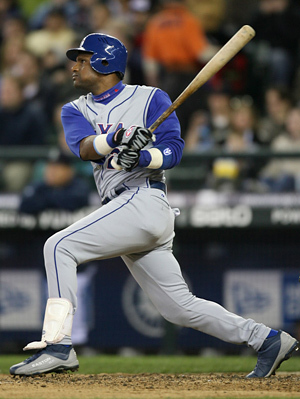 He started the 2007 season as the Rangers' designated hitter and occasional right fielder. I didn’t come back to reach 600 homers," said Sosa, when asked what motivated him to return to baseball after a one year hiatus. "I'm looking for more than that. I'm looking for 700 home runs. I'm a greedy person." This attitude helped “Slammin’ Sammy” crash through the 600 Home Run barrier…and keep right on going. The landmark homer came on June 20th, 2007, while playing for the Rangers against his former team the Chicago Cubs, for which he hit 545 of his 609 home runs). Sosa hit a 5th inning pitch from Jason Marquis (who happened to be wearing the number 21 jersey formerly worn by Sosa himself) far into the stands, becoming only the fifth man in history, after Hank Aaron, Barry Bonds, Babe Ruth, and Willie Mays, to hit 600 home runs. "It's a great feeling to prove all of those people wrong. There were so many who doubted me. Wow. I couldn't believe it,” Sosa said of his detractors. "I understand that I was out of the game for a year, but give me some credit. You act like I've never been here before." The truth of the matter is that Sosa has been EVERYWHERE before…and he has the homers to prove it. By hitting his 600th homer off of Marquis of the Cubs, he became the first player in league history to have a home run against every baseball team. He is also the all-time home run leader among foreign-born Major League Baseball players with 609 long balls – and counting. Sammy finished his one-year farewell tour with 609 Super-size home runs, matching his bigger than life persona and providing a suitable ending to his career.